Tanzania is home to some of the finest and widest variety of species in Africa for both big game and plain game hunting which together with its large and remote wilderness habitat combine to make the country a favoured premier safari destination for classic tented camp safaris and the country is considered to be the jewel of African Tourist hunting. The country has over 200,000 square kilometers committed to wildlife protection covering National Parks, Game Reserves, Game Controlled Areas, Wildlife Management Areas and Open Areas on village lands. Hunting is carried out in all these areas except the National Parks where hunting or any form of human activity is strictly prohibited. Major International airports in Tanzania are Dar es Salaam (DAR) and Kilimanjaro (KIA). KLM and British Airways (BA) have daily flights from Europe. In addition, flights are also offered by Emirates, Ethiopian Airlines, South African Airlines, and Kenyan Airlines. Most flights arrive in Tanzania in the evening. Please check with travel agent on the time schedule of these flights when booking your flight. A Bushman Hunting Safaris representative will meet you and your hunting party at Arusha International Airport or Dar es salaam International Airport to assist with clearing through customs, collection of baggage, and transport to and from the hotel and charter area. Hotels will be reserved depending on your arrival date into Kilimanjaro International Airport or Dar es Salaam International airport. Our partner hotels include the Seacliff hotels and the Kempinski Hotel in Dar es Salaam. Bushman Hunting Safaris is not responsible for any baggage delays, and the hiring of a special charter to deliver baggage and firearms into camp is very expensive and causes delays in your safari. 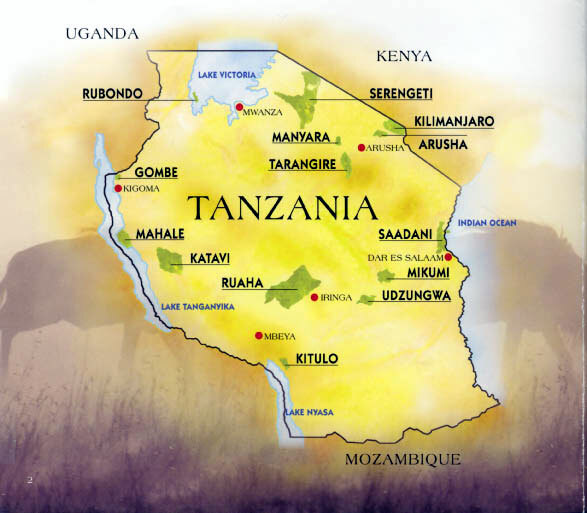 A Tourist VISA is required for entry into Tanzania. Visa forms can be located prior to departure from your nearest Tanzanian High Commission. They are usually issued within 24 hours and require 2 passport photos and a cash payment. Please check with travel agent regarding Visa requirement for your country. Each hunting client may import three rifles and one shotgun into Tanzania, Most shooting for non-dangerous game is best done with a medium rifle of .270 to .338 caliber. For medium rifles the ammunition should be loaded with premium soft nose bullets. Some good examples of this bullet type are Barnes Triple Shock X-Bullet, Trophy Bonded Bear Claw and Swift A-Frame. The medium rifle should be slighted in to strike zero at 200 yards. The minimum caliber for dangerous game is .375. Other popular calibers for dangerous game are the various .416s and .458s and the .470 Nitro Express. For the heavy rifle you should bring the heaviest weight of bullet available for the caliber also loaded with premium soft nose bullets of the type specified above. Your heavy rifle should be sighted in to strike zero at 100 yards. You must notify the airlines in advance that you will have firearms and/or ammunition in your possession. Confirm their policies and regulations on travelling with firearms. All firearms must be unloaded, bolt removed and stored in the gun case. Tanzania is a malaria area and precautions should be taken. Please check with your physician or local health authority for details of health regulations and immunization requirements. Travelling to Africa, especially Tanzania requires a visit to your local travel clinic, personal physician or public health facility to find out what immunizations are required and suggested for your planned trip. Please bring adequate medical supplies of your own medicines. Any prescribed medicine will be the clients’ responsibility. First Aid kits are carried in the safari vehicle and each camp is equipped with a first aid box. Air charters are required to access the hunting areas in Tanzania and a current rate will be provided upon request as prices are always subject to change. Please pack light; we have daily laundry service in camp. Space on the charter planes is limited. Soft-sided duffle bags are preferred to the normal hard suitcases. Due to the remoteness of the areas, transfers between the areas and the major cities are done by private air charters organized by the Outfitter, Bushman Hunting Safaris Limited. Perishable supplies for each safari will also be transferred with the air charters. Due to this, there is a baggage limit allowed on the charter planes. Please check with us at the time of booking regarding baggage allowed as this varies depending on the type of charter. Hunting clothes should be comfortable, quite and sturdy. Cotton fabrics in dark greens and browns are best. Mornings and evenings can be quite cool, therefore a light or medium weight jacket and a sweater are recommended. Lightweight rain gear should be included for November/ December safaris. Laundry is done in camp daily. Camps are equipped with a VHF radio. Communication is maintained between camps and the head office. For emergencies, messages from your home can be relayed from our Tanzania offices to the hunting camps. A satellite phone is available in each camp for emergency use. We recommend that you bring your own satellite phone for personal use. The hunting season begins on July 1 and ends on March 31st. No animal may be shot from, chased or driven by vehicle. Fees set by the Tanzania Government are correct at the time of printing but are subject to change at any time. Any increase in Tanzania payment of Government fees is the responsibility of the client.